Special Note: Get the industry’s first Digital Badge and expand your business prowess. The Digital Badge & Personal Trainer Toolkit is NOW available!! Stand tall, stand apart from the pack. W.I.T.S. is excited to offer a new opportunity exclusively for our graduates and Certified Personal Trainers. 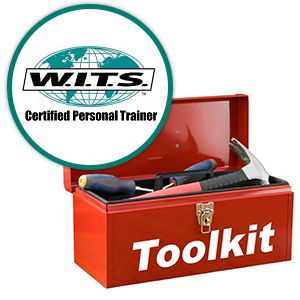 We invite you to join our NEW Personal Trainer Toolkit. We have designed this online resource to help you be successful in your career. Our commitment to you does not end once you become certified. We are invested in your career and professional success. Access to your Certified Personal Trainer digital badge, which verifies your accomplishments and credentials. You can share your badge on emails, websites, Facebook, LinkedIn and other social media sites. Business tips for starting your own company, planning a budget, setting prices, and legal support. Sample forms that you can use for client assessment, exercise programming, and progress charts. Links to videos for exercise and assessment protocols. Access to all videos from your Personal Trainer Certification lectures and practical training sessions. Want to learn more about the fitness industry’s first Digital Badge? How does meta data get me a job? Click here. You will also have access to experienced professionals who can support you in your career. Don’t miss out on this exclusive resource FOR YOU!